Attached link to our new website marrisantiqueglass.com, I hope you will enjoy browsing the new website. 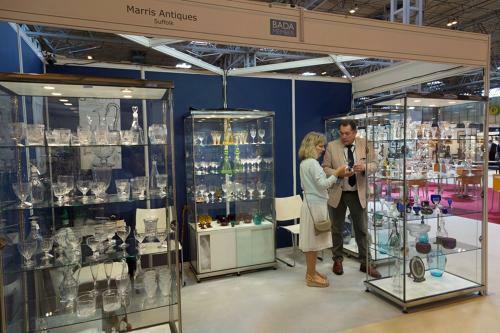 We will be exhibiting a wide selection of 18th, 19th & early 20th century English & Irish glass at the ‘Art & Antiques for Everyone’ Summer Fair at the NEC Birmingham from the 19th of this month. This fair is the largest vetted outside of London. Up to 180 specialist dealers offer a wide variety of desirable, collectable and unusual items which include, ceramics, glass, treen and folk art, silver, jewellery, sculpture paintings, and furniture. All items for sale are vetted by a team of experts for authenticity, date and condition, giving buyers confidence when making their purchases. Celebrity talks will be be delivered daily by Judith Miller and Will Farmer. Judith Miller is a leading expert in antiques & collecting and known for the Millers Guide books. She is a regular specialist on the BBC’s Antiques Roadshow as is Will Farmer who is also an auctioneer, writer and expert in Ceramics, Glass and Decorative Arts. The fair is well known for its featured exhibitions. This summer’s display is provided by the The Button Hook Society featuring many historic pieces. Come and visit the fair, it is a great day out for collectors, interior designers and enthusiasts alike. This well respected fair takes place three times a year in Spring, Summer and Winter. The Summer Fair takes place from from 19th - 22nd July 2018. Please contact me if you would like a complimentary ticket. Click here.